Zignature only uses natural ingredients in their foods, which means they never contain artificial flavors, preservatives, or colors. Zignature only uses natural ingredients in their foods, which means they never contain artificial flavors, preservatives, or colors. They are also free of corn, grain, wheat, soy, potatoes and potato starch. Potatoes have been identified as a high-glycemic binder for dog food and may cause potential problems with diabetic dogs. A food’s glycemic index refers to how quickly a food is turned into glucose and released into the blood stream after being consumed. Zignature only uses low glycemic binders such as whole chickpeas and garden peas. We also love Zignature's focus on using real meat as the first ingredient in their foods. Dogs are carnivores and require animal protein. 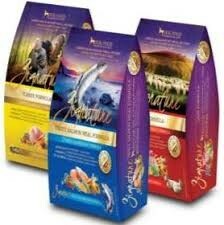 The first ingredient in any pet food is important because there is more of that ingredient than any other. Zignature is backed up with meat meal as the second ingredient to ensure that your carnivore gets the animal protein they crave and deserve. Unlike many well-known pet foods, Zignature doesn't use high starch carbohydrates as their first or second ingredient. Ready to give Zignature a try? Pick up a FREE sample of Zignature, Fussie Cat and Earthborn Holistic pet foods any Saturday in December from 12-3 p.m.!